The Big Gift List - I've received an invite! This short guide will explain the process for viewing a list you've been invited to and how to select one or more items you would like to buy. You can also view a step-by-step guide of creating a new list and inviting your friends to view it here. Once you have registered and logged in you will be presented with your profile page. From here you can quickly access your active lists and any lists that you've been invited to. 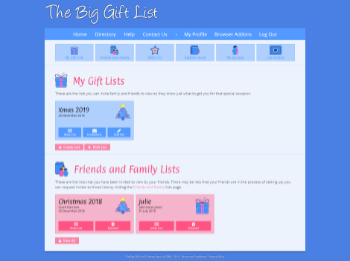 At the top of the page you will find the quick menu that will allow you to access all the main features of The Big Gift List; My Lists, Friends and Family, Wish list, Address Book (for sending invites), My Account (update your contact details) and the Archive (where you can save finished lists). The second section on this page is the family and friends lists click on the View List button of the friends list you'd like to view. Alternatively you can click the 'Friends and Family' button to view all the lists your friends have set up including those that you aren't currently invited to. You can now see a list of items that your friend would like in a similar way your own lists are displayed. 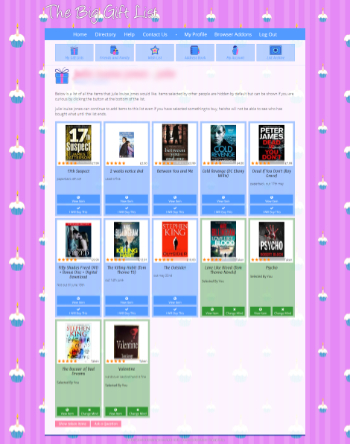 Items that have already been selected by other people are hidden by default (there is an option to show these at the bottom of the page, once shown the taken items are highlighted in purple and 'Purchased' is displayed under the star rating), whereas items selected by you are highlighted in green. The list it sorted by most wanted first as shown by the star rating in each items box. To select an item, simply look through the list and click the 'I will buy this' button - you can always change your mind later. If the item is a contribution item you can click on the 'Pledge Contribution' button to enter an amount you are willing to pledge towards the total value of the item. Once you've made your pledge you can print a contribution voucher to put in the birthday card so the friend knows what the money is contributing towards. Once you've selected an item it will be highlighted in green and Taken will be displayed instead of the items price. Any other person viewing this list will see the item displayed in purple (and hidden by default) to avoid them from selecting the same item (unless the lists owner wants more than one). There will also be a new option available - Change Mind. Clicking 'Change Mind' allows you to remove yourself from the item and allow someone else to select it instead, this could be because you have either decided to get something else, or perhaps you were unable to get the item. That's all there is to it. All that's left for you to do is to buy the item for your friend and wait for the big day (if the item in the list has a 'View Item' button you can click it to view it in an online shop to buy). If you need to ask the list owner a question you can do so by clicking the 'Ask a question' button at the bottom of the list.